BikeCharge Dynamo from Hong Kong-based iBikeConsole has updated the bicycle wheel-mounted DC generator of your childhood. It'll fully charge most brands of mobile phone over the course of a 2- to 3-hour bike ride. The weatherproof, all-in-one design is said to be 20% lighter than similar systems and has a quick-release clutch so riders won't experience any resistance when the device is not in use. 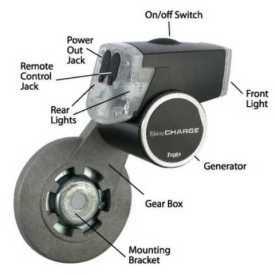 As well, the BikeCharge Dynamo offers DIY installation which is tool-free when used with Quick Release wheels. While the BikeCharge Dynamo gives a nod to its mechanical generator forebears, its modern high-tech design and engineering are a match for cutting-edge personal mobile devices such as iPhones, smartphones and MP3 music players. 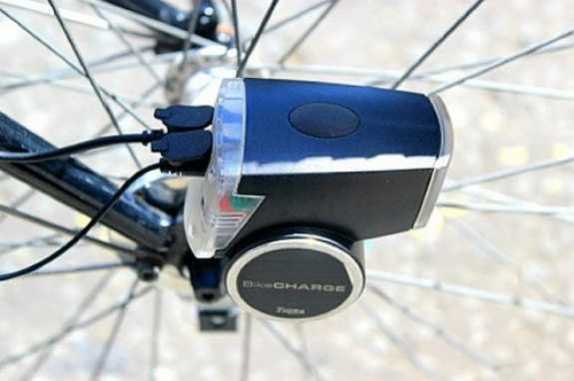 In fact, the BikeCharge Dynamo will charge any USB-powered device via a 3W 5.0V DC output. With the clutch engaged, the BikeCharge Dynamo starts working when the rider's speed reaches 5kmh and full capacity is achieved at 20kmh (based on 26” wheels). The compact case features a beam angle adjustable 1W front LED with integrated lens optics and a pair of S/B LED rear lights. A remote-controlled lighting switch allows the rider to activate the lights without stopping the bike. iBikeConsole is offering the BikeCharge Dynamo compact power generation system for 632 yuan or $99.99 plus shipping. That's some wheel deal! UPDATE: The Bike Charge Dynamo is not available in the U.S., but SpinPower for Smartphones and SpinPower for iPhones have many of the same features and may be worthy of a look. It would be great if such a charging system could be integrated into a bike so that it could also power lights and a horn. Bike bells are almost useless at speed.